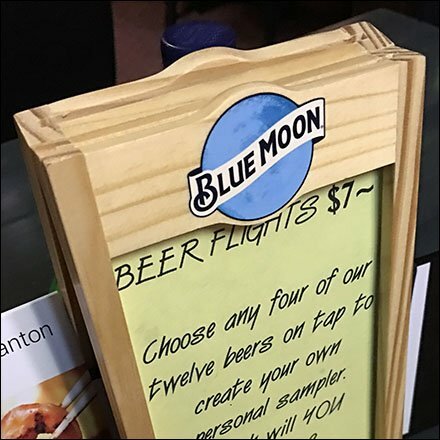 Hospitality retailer and Brewery conspire for sales with this Goldsteins Deli Table-Top Menu Easel by Blue Moon. Goldsteins Deli promotes multiple sales with the offer of your choice of any 4 of 12 resident Craft Beers for only $7. The Blue Moon branded table-top Easel reminds that theirs could be one of your choices. Four beers in a single Deli sitting a bit much, then order the Blue Moon alone. Consider this Goldsteins Deli Table-Top Menu Easel by Blue Moon in various gallery of images views.